Ever since the release of Moneyball, sports analytics has been an area of interest for sports teams, athletes, fans and gamblers alike. More and more often it has also become an area of interest for entrepreneurs and innovators, and a variety of small businesses have emerged with solutions and services that help teams—and the people who cheer for those teams—to make better decisions. At MaRS Data Catalyst, we’re interested in the ways that better data can help entrepreneurs to make smarter decisions about their businesses and we’ve been seeing some parallels between sports analytics—the way teams use their data to change the way they play—and the data on Ontario’s innovation ecosystem. We recently chatted with Alex Rucker, senior analytics consultant for the Toronto Raptors, about the analytics platform he developed for the team, as well as how the data gathered is being used and how those lessons can be useful to people outside of the sports arena. Starting two seasons ago, the Toronto Raptors (along with several other teams) installed SportVU cameras in their arena. These cameras provide a bird’s-eye view of the entire game, as well as an associated data feed that delivers player, ball and referee locations (more on that below). The NBA has begun publishing some of the data in aggregate on its new stats portal and analysts are figuring out how to slice the data and develop actionable recommendations for players and coaches. The SportVU cameras provide an XML feed with the location of all of the players, the ball and the referees. The granularity is 1/35th of a second, a single frame of video. A game generates over a million rows of data: 14 data points x 35 frames per second x 2,880 seconds per game (48 minutes). Using the millions of rows of data from these cameras, Alex and his business partner, Keith Boyarsky, built a modelling and predictive analytics system that can directly inform coaching decisions, such as shot selection on offence and positioning and rotation on defence. The models can also provide input into player personnel decisions, such as playing time and combining players into units, as well as insight into potential trades and contracts. As he leads the analytics team, Alex uses these models to offer important insights to coaches, trainers and management—insights that they wouldn’t have been privy to without the ability to process all of the data. The analytics team is also able to provide visualizations and reports in formats that make sense to coaches and that address their specific needs and concerns. The parallels between the sports arena and the business world are evident. While entrepreneurs and management have always used information to guide their decisions, the sheer amount of data that is now available can give important depth and context to those decisions. With the growing amount of available data, we need more solutions, services and resources that are able to turn that information into actionable insights. Alex explains how this shift, which is relevant to all innovators, has progressed in professional basketball. “Most basketball analytics has been done with the available summary data. However, box-score summaries do not include much valuable information on defence and there is a limited amount of data to work with,” he says. “Play-by-play data adds another layer of depth to potential analysis, but still does not provide a complete picture. While you may know how the sequence ended (a shot was made or missed, or the ball was turned over) the data still lacks context about how the play developed, where the players were positioned and what options were available at each juncture. Camera data allows the analysts to model and predict at a much more specific level,” he continues. The following video shows how the technology can be used for analyzing a play. 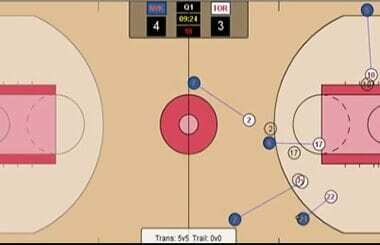 It shows data collected from one play during a Raptors game last year (the Raptors are the white circles). A coach could use the video to get a sense of how the play developed and the critical points that occurred to get to the final result. In this case, the Raptors could use the data to better inform defensive tactics. While Alex is focused on making the Toronto Raptors a better basketball team, he is also aware that what he’s learning in sports analytics can be applied to his larger business ventures. “The notion that objective, data-driven analysis should inform decision-making and will result in better decisions is absolutely correct, and that can and should be applied in any industry,” he says. It’s a notion that we agree with and we look forward to seeing more tools, services and solutions for entrepreneurs in Ontario to turn their data into insights and to increase their competitiveness. At the same time, we’re cheering on our home team on their hopeful playoff run. Alex is going to do his best to make sure we’ve got a good product to cheer for. The full interview with Alex Rucker is published on the Data Catalyst site.